Winter may be a memory of the past, but skin can suffer greatly in spring and summer, too. Sure, a dry, cold climate produces dehydrated, chapped skin, but hot weather creates the need for processed air (a.k.a. air conditioning), which leaves the skin just as parched and cracked, if not more. While there are plenty of amazing body butters on the market to soothe your sad skin, sometimes it’s more fun – and rewarding – to do it yourself. 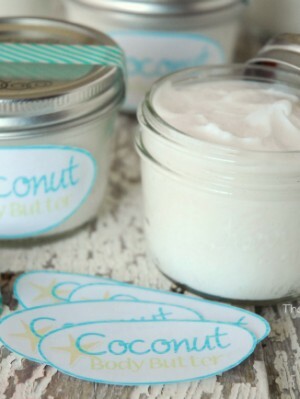 This DIY whipped coconut body butter is amazing! It’s relatively simple to make at home, and the results rival the prepackaged creams. Plus, you can cater the ingredients to suit your specific skin concern, and you can’t beat the fresh and natural coconut scent that literally smells like summer in a bottle. Dispense the body butter into a mason or jelly jar or similar container, slap a homemade label on it, maybe even a pretty bow (or a strand of twine), and you’ve got yourself a lovely – and reasonably priced – homemade gift! Coconut Oil – A natural moisturizer that quickly absorbs into the skin; contains 3 fatty acids – capric , lauric, and caprylic acids which help kill certain fungal infections (read 10 Unconventional Uses For Coconut Oil, here). Almond Oil – Contains vitamins E and B and essential minerals; aids in repairing sun damage. Vitamin E Oil – Extremely moisturizing antioxidant that boosts collagen and cell rejuvenation. I read online that whipping hard coconut oil (you cannot heat or melt it first) has a similar effect as doing so with shea butter, which is the base for most DIY body butters. 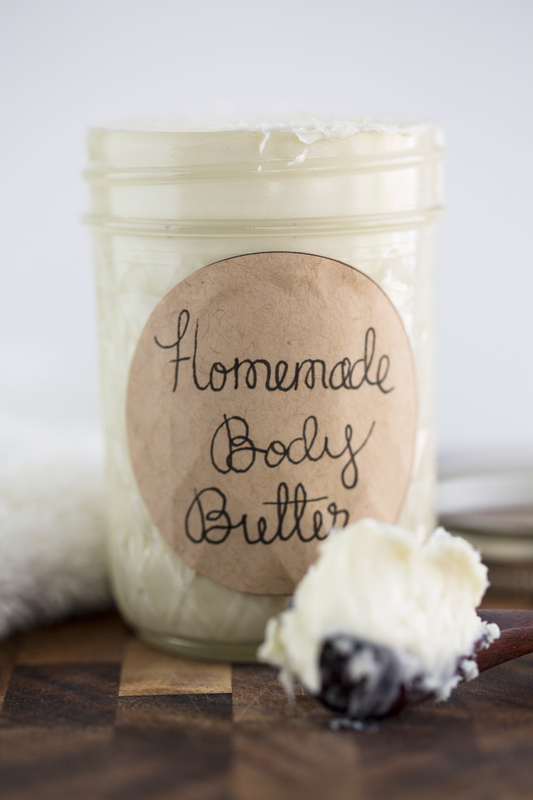 So, this recipe makes a killer whipped body butter without any shea. Whipped is actually much easier to apply, and it has a fluffy, light consistency as opposed to the hard-as-a-rock consistency of its solid counterpart. To whip your coconut oil, mix the solid coconut, almond, vitamin E, and essential oils into a bowl. According to Living The Nourished Life, using an electric hand mixer will get things whipped up, but a Kitchen Aid Classic Stand Mixer ($25), will really do the trick — and quickly. Whip to desire, but no more than 8 minutes, as you don’t want to completely liquify your butter. After 4 minutes, try a dollop of body butter on your hand to test for consistency and smell. If you want more scent, add additional drops of essential oil now and continue mixing. Once you’re butter is whipped to your liking, remove and place in a mason or jelly jar. Store in a cool, dry place. This stuff will last awhile, but I suggest making a new batch every month. *Accompany your whipped body butter with this DIY Lemon and Sugar Scrub. The rising temperatures inevitably have you sweating more than a whore in church. Sorry… was that too much? The heat tends to go straight to our head and affect our better sense of judgment. In any event, beyond your standard ways of cooling off (jumping in a pool, taking a freezing shower, sitting directly in front of the AC), there are several beauty products that have cooling properties and can kinda, maybe, sorta cool you off like sticking your head in the freezer! Summer means a lot of sweating, so in all likelihood you will find yourself washing your face much more frequently. To avoid over-drying, try Fig + Yarrow Cleansing Nectar ($30) and wash without disturbing your skin’s delicate pH. It’s filled with lavender and aloe to calm and invigorate. Sunscreen can often feel sticky and goopy. That is far from the case with La Roche-Posay Anthelios 30 Cooling Water-Lotion Sunscreen ($36), which has a water like texture that you will actually find refreshing. Not only does First Aid Beauty Vitamin Hydrating Mist ($16) reawaken your skin, it lightly hydrates and simultaneously protects from environmental irritants. Pop the small bottle in your fridge for an added boost of refreshment. Whether your eyes are puffy from a salt-filled summer BBQ or a long day at work, H2O+ Eye Oasis Instant Hydrating Stick ($25) has caffeine and algae to cool and nourish tired peepers. Like the spray above, this product is also fantastic in the fridge. 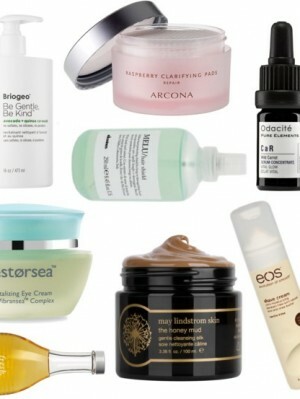 Although moisturizing may feel counterintuitive when your oil glands are in overdrive, it is not a step you should skip even on the hottest of days. Boscia Cool Blue Hydration Essence ($48) is impossibly lightweight, but still intensely hydrating. You’ll feel more chill than you would after a session with your shrink. A short jog in serious heat and humidity can feel like a marathon. Soothe your tired muscles with Mio Workout Wonder Invigorating Muscle Gel ($33), which has a cocktail of herbs and extracts to feel like an ice pack on your skin. You know those days when you do a full face of makeup only to have it completely melt off by the time you arrive to the office? Luckily, COOLA Suncare Classic Face Makeup Setting Spray SPF 30 ($36) can prevent those dreaded occurrences. Not only will it keep you cool and refreshed, but it’ll also protect against UV rays. Getting that gross film of dirt and sweat off your body after a long day is a serious task. C.O. Bigelow Mentha Body Vitamin Body Wash ($12) will leave you feeling downright chilly. What could possibly be better? Okay, maybe a cold glass of wine waiting for you when you’re done showering. Maybe it’s that beauty brands are taking note of all the #eeeeats posts on Instagram, or perhaps they are focused on the undeniable skin benefits of food, but edible ingredients are showing up everywhere in our beauty products. While we’re all for a good DIY situation, the convenience of these powerhouse foods in ready-mixed formulas is certainly worth consideration (and ingestion). While many eye creams with active ingredients cause irritation, Restorsea Revitalizing Eye Cream ($85) has a proprietary complex from a salmon egg enzyme to diminish fine lines and brighten, and is much gentler than its chemical-filled counterparts. Davines MELU Hair Shield ($34) is a must before heat-styling thanks to the protection it offers from lentil seeds. One Love Organics Oh Mega Calming Chia Oil ($49) relies on organic chia seed oil to soothe irritated skin. Breaking out? Look no further than Arcona Raspberry Clarifying Pads ($36). These are a must post-workout. While it may sound like a superfood salad, Briogeo Be Gentle, Be Kind Avocado + Quinoa Co-Wash ($36) is a non-lathering cleanser that conditions and nourishes while cleaning your locks. It would certainly be easy to mistake Eos Vanilla Bliss Shave Cream ($4) for yummy cupcake icing considering the consistency and smell, but it’s not. This stuff makes shaving a cinch. To double up on the relaxation while soaking in a tub full of Fresh Sake Bath ($82), bring a class of wine in as well! While we love carrots as a vehicle for our hummus addiction, the glow that they provide in the form of Odacite CaR Wild Carrot Facial Serum Concentrate ($55) is pretty clutch as well. Not only does May Lindstrom Skin The Honey Mud ($80) feel and look like pudding, it utilizes naturally antibacterial and healing raw honey to soothe skin. 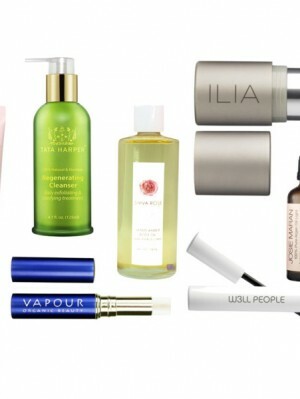 Today is Earth Day and to celebrate all that is Mother Earth, we’ve chosen a few of our favorite all-natural products. While you don’t need to entirely switch your beauty arsenal to one of 100% non-toxic ingredients, it’s worth easing your way into a few key products that produce the same – if not better – results with healthy formulations that’ll do you – and the world – some good. 1. Lanolips The Original 101 Ointment ($16) – Think of this as the non-toxic, 100% natural version of Aquaphor. It’ll cure chapped lips, hydrate cuticles, and even add a hint of sheen to brow bone. Obsessed! 2. Vapour Organics Trick Stick Highlighter in Star ($20) – Few highlighters are better than Vapour’s cult-favorite. And this one is good for the planet, too. The 100% natural illuminator blends seamlessly to give the face a strobe-light-effect on high points, like cheek and brow bones, cupid’s bow, and bridge of nose. 3. Tata Harper Regenerating Cleanser ($78) – By now, you’re probably familiar with Tata Harper’s magical all-natural skincare line. This cleanser is certainly a favorite. It can be applied to dry skin as a gentle exfoliator, or add water for a daily cleanse for all skin types. The.Absolute.Best. 5. W3ll People Expressionist Pro Mascara ($21) – It’s hard to find a natural mascara that works. But we’ve done the impossible: W3ll People has an incredible inky black formula that lengthens and volumizes, while being 100% cruelty-free, petroleum-free, paraben free, gluten-free, coal tar-free, fiber-free, talc-free, aluminum-free, clump-free, and made with certified organic beeswax. Oh, and that applicator? It’s legit awesome for de-clumping and coating all those tiny lower lash hairs. 6. Josie Maran 100% Pure Argan Oil Light ($48) – When it comes to straight-up argan oil, nobody does it better than Josie Maran. We like the light version because it can be used on acne-prone and sensitive skin, and it absorbs faster. In fact, argan oil moisturizers while controlling sebum production, so there really is no excuse not to add this smoother-skin product to your beauty routine. 7. Ilia Beauty Multi-Stick ($34) – Like the name suggests, this stick does multiple things: It gives color to eyes, cheeks, and lips, while also injecting skin with healthy ingredients – like vitamin E and shea butter – as it adds that coveted hint of hue. Layer for bolder color. Our favorite: I Put A Spell On You, a tangerine shade that is universally flattering on all skin tones from fair to deep, and all hair colors from blonde to red!